Member Benefits - TAILS Foundation Inc & PETwork Society! then click on Subscribe button for payment. 3-5 business days. Thank you!!! TAILS Foundation creates a variety of events that enable members of the business community to meet and mingle. 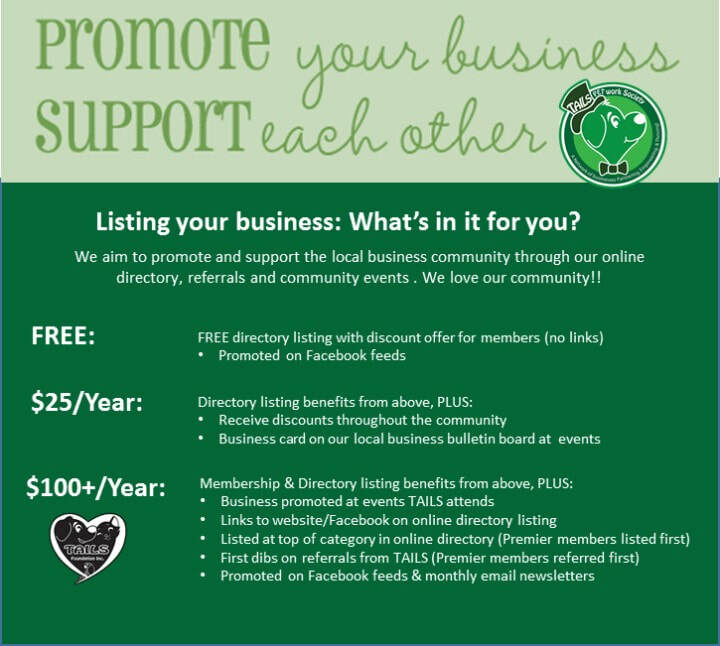 These are great chances to promote your business, meet new customers, and learn what's happening in your area. The hundreds of people who contact TAILS each year for referrals are given the names of TAILS members only. Period. If you're a member, you're referred. If you're not, you're not. Visibility and exposure are the keys to effective marketing, and TAILS is where you'll get them. Through newsletters, business trade shows, and now the World Wide Web, only TAILS members will have the niche in this market. Energetic volunteers and staff ensure that TAILS members get the most from their investment. Getting involved is one of the ways, and TAILS has several committees in which you can participate.